Beautiful savoy flat for 4 to 6 persons with warm decor furniture and panoramic view. tv flat screen of 81 cm. open fire, car park, balcony with very nice view. Free wifi access at 50m you can have a garage possibility of sauna and jacuzzi at 50m in more. Despite it being the height of the Christmas holiday, and not much snow,we had a great ski vacation. Spent 2 weeks in Morzine, and found plenty of great Alpine and some Nordic skiing in the upper elevations. 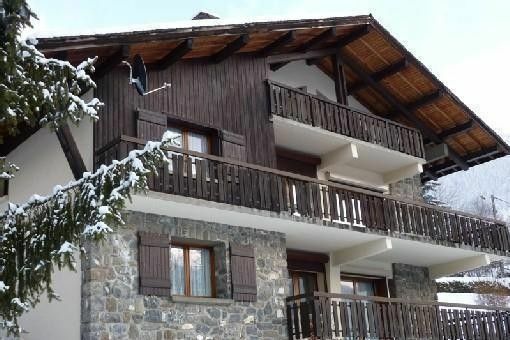 The apartment lies in the valley between Avoriaz and Les Gets ski areas within 5 min. walk of lifts that take you to either one. We had a car, but could have done pretty well without one, as the town, restaurants, grocery, etc. were an easy walk. Apartment was immaculate, bright, and very comfortable. Wy-fi was out for a few days, but finally restored. Nice view across the valley of mts. Owners were very nice. Suggest you bring soap, rags, sponge, dish towels, hot pads,spices, as there was nothing in the kitchen but cookware and utensils. Great, family vacation for 5. Had a wonderful 10 day stay at this apartment, which was very clean, spacious and exceeded our expectations.There was plenty of space for our family of four, private parking and access to a garage so that we could store our bikes out of sight. Sitting on the wide balcony any time of the day was a delight. From here we could enjoying the view over the town, watch the cable cars glide up and down the mountains, marvel at the mountain bike riders charging down the tracks and see people of all ages enjoying themselves on the luge d'ete. Town, swimming pool and ice rink were no more that 5 minutes walk away and we took full advantage of the Multi-pass (2 euro per person per day) so we could ride the chair lifts and cable cars to our hearts content. Chamonix and Mont Blanc about 1 hour away by car but Morzine and Avoriaz provide plenty of entertainment. Would like to see it in the ski-ing season. I would certainly recommend to friends and family. The owners were very friendly and we would like to thank them for a lovely holiday. Appartement très propre situé à un jet de pierre du centre de Morzine. Lumineux et très bien agencé. Les propriétaires sont charmants et disponibles. Nous avons passé un très beau séjour. On a passé une semaine ici avec ma sœur, mon beau frère et mon mari. On a une amie qui habite à Morzine et c'est la septième fois que nous avons passé une vacance à Morzine, mais la première fois à cet appartement. L'appartement c'était absolument magnifique. Très propre et très confortable. On a eu un accueil très chaleureux de tout la famille Marullaz, particulièrement, Christiane. L'appartement est idéal pour quatre adultes. C'est bien situé pour Morzine sans une véhicule car il y a des Navettes gratuites dédiées; arrêt à 50 m. On a acheté le Multipass de l'hôtel pour un bon prix. Nous reviendrons là pour une autre semaine. Merci beaucoup. 3 semaines passées cet été dans cet appartement, très belle vue, propre, qualité de la literie, situé à quelques minutes du centre ville, du palais des sports avec de nombreuses activités. Accueil très sympathique et prévenant des propriétaires. formidable rien à redire.